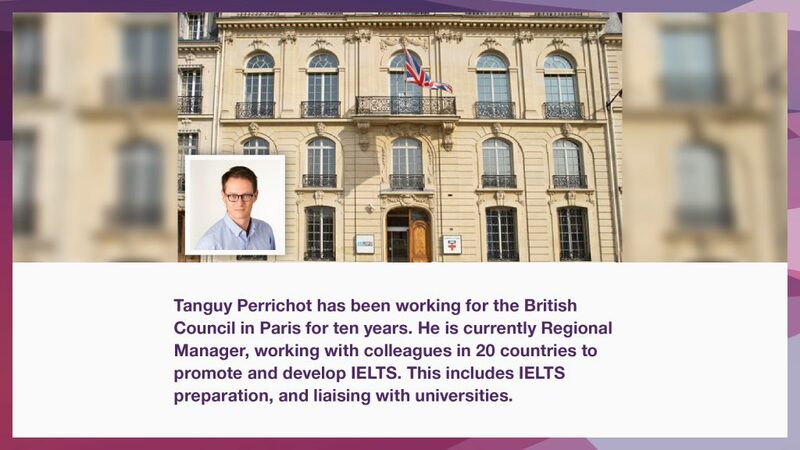 On a visit to British Council Paris (pictured above), Clarity’s Andrew Stokes (AS) talked to Tanguy Perrichot (TP) on providing IELTS support to universities in France. They discussed a successful approach to guided self-access. AS: It’s well known that IELTS candidates in different countries tend to have different challenges. Is there a common issue for candidates in France? TP: In France, in general, I would say Writing. That’s what we’ve seen in different schools — even the elite schools. The candidates can be quite good at writing in French and producing an essay, but writing in English in the IELTS format is a problem. It’s definitely an issue if they are not trained properly in the format, in what we expect from them. Also Speaking. But the main problem here is that they are shy, they’re not used to speaking in English. AS: The British Council in France has been very successful in helping candidates meet the challenges of the Writing paper. Can you tell us about that? TP: Well, in France we offer IELTS to individuals, of course, but also we work closely with universities — state universities and private universities. In France, students have to study abroad during their course. It’s part of the curriculum. So we support this “mobility”, this internationalisation in the universities by providing IELTS and, crucially, by helping students to prepare for it. And it’s not just the students. We also support the teachers by delivering teacher workshops. This is all about how they can prepare their students to understand the test, to better perform in the test, even to to improve their level of English. This is very much part of the IELTS package and it’s been very successful. The Road to IELTS platform is a central part of this. AS: How do they use Road to IELTS within the university? TP: IELTS practice is not imposed and there are no IELTS preparation classes. It’s a system where students work independently, but are monitored by teachers. Let’s look at the case of Sciences Po, which works in a very logical and effective way. Firstly, the teachers show Road to IELTS in class. They demonstrate the different parts of the program and how it works. The purpose of this is to enable the students to work individually. Then, when the students have spent some time on the program, the teacher looks at the progress, and sees what the students have done and where they might need help. They have a face-to-face class, focusing on specific issues with a group of students. So, if they have some issues on a specific task in the Listening test, then they form a mini-group to work on it. And of course mostly, the same issues will come up year after year, so the teachers become more and more expert at predicting problems, and at helping to solve them. AS: And what sort of feedback is the British Council getting from the universities? TP: Well, the institutions who use Road to IELTS, they renew their licence because they want to use it year after year, you know, with the new students. It was really interesting to compare when we first introduced IELTS without any support: it took one or two years for the teachers to be trained properly, and to understand the format. This is another area where Road to IELTS really helps. IELTS preparation: Getting students excited, which outlines a successful 45-minute orientation session to get your students started on the IELTS journey. “I’m a busy teacher and we don’t run IELTS classes…”, which suggests a four-step process that will provide a structure for the students’ work, leaving the teachers free to guide and advise.